Home » Blog » Success Stories » Client Success-Story: “Amazing agent found me a property in just 1 week”, Cherif A.
Cherif was relocating to Singapore for work and he needed a place to stay. The agent he met on Propseller helped him find a comfortable serviced apartment upon landing in Singapore, and secured the perfect apartment for him in just a week! It took me just 24 hours to get in touch with an actual agent with Propseller, which is faster than I expected. You’re basically uprooting your life and moving to another country. This means you have to start from scratch – on top of finding a place to stay, you also need to get your kids enrolled in a school, work out your daily commute and more. That’s why it’s such a great help to have a property agent that you can rely on. Upon confirming that I was coming to Singapore from work, I started asking around for recommendations. A friend told me I would be able to find the best property agent on Propseller, so I found the website, and had a look. After I submitted an enquiry, someone got back to me immediately. I also liked that Propseller screened the agents to suit my criteria before recommending individuals to me. This saves time and speeds up the process. I decided to work with Marie-Christine, who was the agent that Propseller recommended to me. (Bonus: she was French and could understand all my needs and requests perfectly). I can’t tell you how great it was to arrive in Singapore and be able to check into a comfortable place immediately. It was also great that we were housed in a comfortable serviced apartment and not a hotel. I’ve stayed in a hotel (again, while relocating) for a month before, and by the end of that time, I was going crazy. Hotels are just too restrictive and you can’t cook in them. The service apartment had all the facilities we needed and the price was affordable as well. 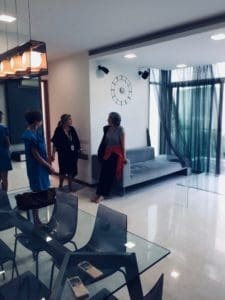 A month before I arrived in Singapore, we worked out all the details and Marie-Christine started searching for apartments. Marie-Christine certainly lived up to her name of being an amazing agent to find property. She was extremely well-prepared when we arrived in Singapore, so we were able to view 7 different apartments on the first weekend after we landed. I was really impressed – all the apartments we saw fit our criteria, so it was just a matter of choosing the one we liked the best. Some of the apartments were in swankier, higher-end areas such as Orchard Road, and others were in neighbourhoods which were also well-located, but less trendy, such as Holland Village. In the end, we decided upon a unit at Holland Village. The unit was within budget, so we didn’t negotiate the rent, but we did want to get new appliances. Now, the landlord was quite insistent on his position at first. He had a “take it or leave it” attitude. I’m not quite sure how Marie-Christine did it, but she somehow convinced him to add in several extras for us. We changed the oven, bought new curtains, bought a dishwasher, changed the fridge, and repainted the house – all at the landlord’s expense. All in all, I’m pretty sure the landlord spent more than a month’s rental on our requests. Again, I don’t know how Marie-Christine did it – she’s absolutely amazing at her job. In European countries, for example, your agent helps you get an apartment – and that’s it. There’s zero chance that they’ll help you negotiate the rent, or ask for additional perks. Marie-Christine didn’t just do this for us, she also went the extra mile to fork out a deposit for us (because we didn’t have cash on hand). We paid her back after that, of course. Marie-Christine was also extremely helpful in answering all our (non-property-related) questions. Among other things, we asked her where we should buy our groceries and kitchenware; she was very patient with us and shared plenty of information. Thank you, Propseller, for recommending me an amazing agent to find the property I was looking for! I travel a lot for work and I’ve relocated several times as well. I can honestly say that this experience that I’ve had in Singapore is one of the best ones so far. Today, we regard Marie-Christine more as a friend than a property agent. She’s been to our place twice for parties and she’s someone that we will definitely keep in touch with in the future. Thank you, Propseller, for recommending us an amazing property agent that made our apartment-hunting process such a breeze!